There is also conflict between refugees, mostly over the scarcity of resources, with people sometimes fighting at the food distribution centre and at the water tap. “We need to resolve these things before they escalate because it's like a matchbox. Everyone here is stressed. So you sit down and just talk to them,” he says. Mohammed has no passport, no official date of birth and had never been anywhere outside the semi-arid climate of Sub-Saharan Africa until now. At the opening of the Annual Meeting in Davos, he said that he and his people feel like they are on the side-lines of the debate over the future of the world economy. For years, refugees have been mainly dependent on humanitarian assistance with minimal livelihood and self-reliance opportunities. UNV’s UN Refugee Volunteer assignments, like the one Mohammed has been involved in for the last three months, offer refugees the opportunity to take an active role within the camp, participating in community outreach and social protection activities that not only provide a safety-net for the camp’s inhabitants but also contribute to their wellbeing and development. 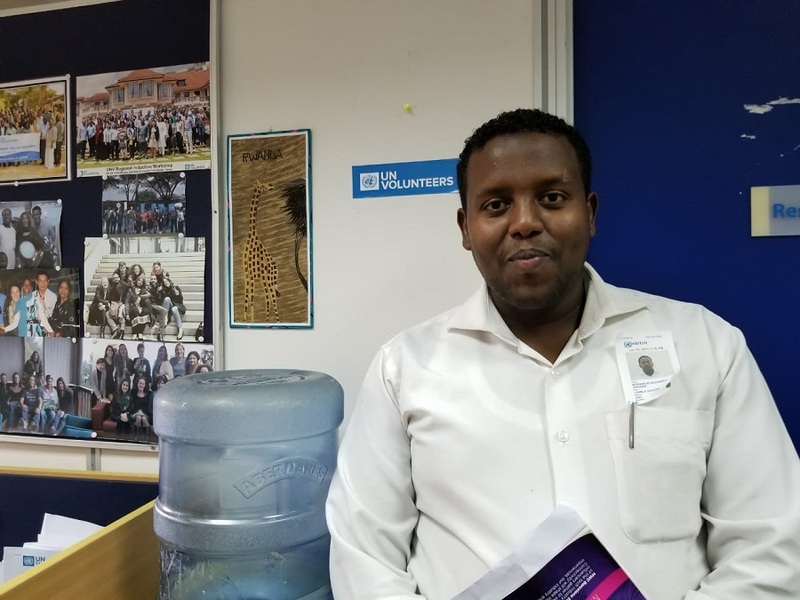 Mohammed Hassan Mohamud's UN Volunteer assignment was part of a project funded by the German Ministry for Economic Cooperation and Development (BMZ), in collaboration with UNHCR, for a peaceful coexistence amongst refugees and host-community members through volunteerism.